It is not everyday that an inauguration takes place - No! I am not talking of shops or establishments being opened... not even new trains or lines.. but an all new Bus service! The City of Kochi, smack in the middle of the South-Indian state of Kerala, holds a very important place in the economy of the state. The city has over 650 buses constitution a very efficient (err! Over efficient) city public transportation. All the buses are owned and operated privately, with the Regional Transport Authority standing a meek spectator to the gory road races. The high number of buses mean an astonishing frequency of as high as a bus every minute on some routes! The high frequency means very low 'gap' between two buses, this in-turn results in high competition between buses to garner each ones' share of passengers. Kerala is not one state known for wide roads, and Kochi City is no exception to the norm - the roads here are too narrow to sustain buses rushing through at 60+ speeds. It has been a long standing demand from the passengers of Kochi City, that KSRTC (the state-government run transport company) start city buses. The KSRTC on its part has reserved 50 city permits for itself - which has never been used, even partially. The Central Government's JNNURM Funding for buses gave a much needed fillip for Kochi's needs. This scheme issued funds for purchasing as many as 200 buses, exclusively for the city! Of the 200, 50 were AC Ultra-Low Floor buses (from Volvo), 120 Low Floor Non-AC buses (from Ashok Leyland) and 30 Mini-buses (orders are still to be placed - likely to be scrapped). The Volvo buses were flagged off in a lack-lustre function on December 28, 2009 by Union Minister, KV Thomas. The non-AC Ashok Leylands were flagged off by State Transport Minister Jose Thettayil on May 14, 2010. Like I mentioned earlier, Inaugurations to not happen daily. Being a fulfillment of a long-pending demand from citizens, I thought it would be right event for me to attend. The event was scheduled for 5pm at a small ground near the Kerala High Court, on Marine Drive in Kochi City. I had confirmed the programme the previous day from appropriate authorities at the bus station. The next day, I landed at the venue around 4.15 pm. Two buses (out of 9, to be flagged off that evening) were already brought to the venue. A small complement of policemen were standing guard to the ground, while a larger contingent of KSRTC officials were seen arranging for the event. The buses were being parked in serial order, in straight line, parallel to each other. The buses continued pouring in one by one. I was joined by fellow bus (and rail) fan Jimmy Jose. The buses were opened up, and the public could have a feel of them. Press photographers were busy clicking left right and centre, while myself and Jimmy captured as much details as possible. We went about clicking the buses. Officials arrived at the even very soon - the first to arrive was the Mayor of Kochi. She was quickly accompanied by senior officials from the KSRTC Regional office, and officials from Kochi Corporation. They decided to start off the event before the chief guest arrived - the Transport Minister, was expected to arrive very soon. There were too little audience, but almost all of them were excited. Once the public settled down to the function, myself and jimmy went on the rampage clicking the buses from every possible angle. We talked to some KSRTC employees present at the event and to some technicians from Ashok Leyland. The transport minister arrived a while after the function started - things went lightning fast after the chief guest arrived. The Mayor of Kochi was praising her non-existent achievements and highlighted her corporation's policies - it must be remembered that it is the very same corporation that played spoilsport in the introduction of services in the City. Once the minister got his chance to speak, he was all praises for the Ernakulam Zonal office. The JNNURM services in the city was earning much more money than expected, and the services were far far better in financial health compared to the ones in the capital city. He promised that KSRTC would start city bus services in the city before winding up his talk. The buses being flagged off! The minister got to task soon. A green flag was brought out, and the inaugural bus - JNK58 - was brought closer to the stage. The minister symbolically flagged off the service before the doors were opened for passengers. The driver on the inaugural run was one Mr. Surjith, and the conductor was Mr. Xavier. Xavier was all in smiles about being able to man the maiden run of the bus! We (myself and Jimmy) jumped in to get a good seat for ourselves. Passengers flocked into the bus, and soon all seats were taken. Meanwhile, one stamp-pad organisation, which proudly took credit for introduction of the services, decorated the bus with a garland and stuck up a notice on the windscreen. The engine was powered to life - but no noise, barring a whisper at the front! There were no vibrations or harshness at idle or when the engine was 'raised'. The Inaugural bus.. JNK58 all set to head out. The crew of the inaugural bus: At the wheel, Mr. Surjith. The Conductor is Mr. Xavier. The bus crawled out of the venue quickly, and stopped at the very first bus stop. The bus was filled up in a couple of seconds. The bus moved without a grumble even as it was reeling under heavy crowd - every inch of space was taken. The driver had some trouble putting the right gears, and the bus "regurgitated" at some occasions. The bus was "welcomed" at every other stop. The bus was decorated further, and was showered with petals on each occasion. We finally reached the destination - Njarakkal. The last stop was on a narrow piece of road - where there was no space for the bus to wait for passengers or for the crew to stretch their legs a bit. Forget all these, there was no way a 12M bus could turn around!!! At one of the welcomes given to the bus en route. 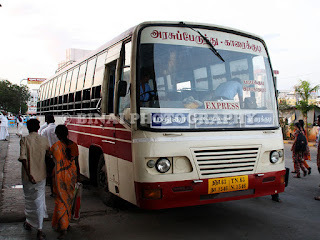 The driver took the bus further towards Cherai - he drove some 3-4 kms to enter a parking ground. It was a pain turning the bus around, and almost every one in the bus had to get off to control the traffic on the road, to let this bus turn. The bus blocked up traffic on the road - the return departure took some 15 minutes to commence. There was a huge traffic block by the time the bus moved out. In the process of giving way to the traffic, the bus hit a stone block, and the rear left lower portion of the bus was slightly damaged. The return departure was eventless - the driver let the beast rip. Only a few KSRTC officials, yours truly and some passengers were present on the return trip. The driver did stop at some places to pick up passengers. I was dropped off near the High Court. I picked up my car and returned. At the end of the inaugural run! I believe you have traveled on the SLF buses plying in Bangalore as well. How would you rate the Kerala RTC SLF buses with BMTCs non-AC Marcopolo SLFs as well as KMS body SLFs? The buses look pathetic from inside.Finsihing is substrandard. KSRTC never learns from mistakes. City volvo was a blunder and these seems to bigger blunder.Marcopolos are much much better than these. @Anonymous: The buses do not look pathetic from inside. The interiors might not look as good as a Marcopolo, but I'll say this: They'll last much longer than the Marco. The quality of fittings in the Marcopolo is much worse, and they will not last for more than a year. In contrast, the overall quality of materials used in this bus is much better. Volvos were not a blunder - atleast in Kochi. They are making money, and they would be making enough money for their own survival very soon. I agree with anonymous completely. Binai- How can u forecast what is going to happen in future. On the contary there was a news that a AL bus in Kochi caught fire that too within a week of launch. Volvos making money in Cochin - r u joking.Volvos r running in loss even in cities like Banaglore. Morever the Marcopolos offers a service agreement of more than 10 years as the case with DTC. On the other hand KaSRTC which owns the largest fleet of Volvos finding it difficult to maintain it as Volvo refused to renew the service agreement after some time. At Anonymous' (please disclose your identity if you wish to make allegations): Volvos making a loss in Bangalore is no sign that they should make losses in Other cities. Per KSRTC's own records, the buses are collecting a steady Rs. 42 per kilometre, while the break-even target is Rs. 45 per km. So, the current loss is Rs. 3 per km - so they are indeed close to making a profit. I would like to remind you that both Volvo and Ashok Leyland have offered service agreement to KeSRTC. Both the buses are maintained by the respective manufacturers at their own workshops - KeSRTC only operates them. @the second anonymous: I can surely predict what happens after a year. If you have ever traveled in a Marcopolo (the ones in Bangalore and Chennai) - you will surely know the quality of parts they've used in it. Note: Anonymous comments will not be approved henceforth on this topic. SLF buses in kochi sure look much better. Ironically, the fare structure doesn't look attractive. May be that explains the poor patronage of SLF buses, in comparison to Volvos which are nearing break even. Hasn't observed SLFs closely to observe on its fit and finish. Feel KSRTC will do better if they drop the fares to ordinary levels. if the SLF is not going to make profits, then the private bus operators will be benefitted. I liked your blog very much. Felt like I was travelling with you in all journeys. 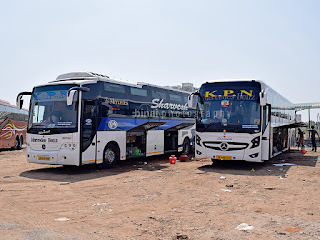 You have mentioned about various types of volvo buses in Kerala-Bangalore routes. May I know each of them in detail?? plus I am also a regular passenger in EKM-BGLR route. 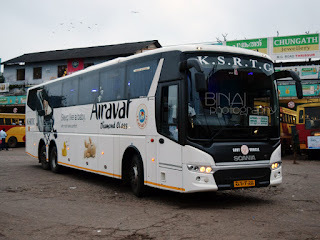 I want to book for KSRTC Garuda from EKM to BLR. But it is given online no Farestage exists b/w these places. Please advice.